This week in Your Parents Basement, we’re vrooming past wet spots and through oil slicks, as we avoid bombs dropped by planes! R.C. 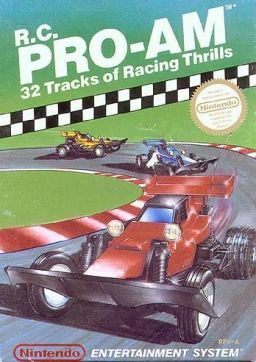 Pro Am 1 from 1987 is the main topic of conversation, along with Nintendo Power’s NES game of 1993 – which was actually released in December 1992 – R.C. Pro Am 2! Also this week, we have ole friend and big fan Pippenz as a guest, and a very special guest toward the end of the sow. We’re also looking for a guest for next week’s show, Comix Zone for the Genesis. If you’re interested in joining the recording, send us an email or comment on one of those social media sites. 0:00 – The intro, which features the main title theme. 32:45 – The YPB boys are joined by a very special guest! 38:15 – Emails. More dark thoughts from Butterscoot, Scooterbutt and Kristina Ricci. – As mentioned on the show, R.C. Pro Am is one of 30 games featured on Rare Replay, which is scheduled to release on Aug. 4 for the Xbox One. Other highlights are the Banjo games, Perfect Dark and the Battletoads games. It’s going for $29.99 to preorder on Amazon. – A perfect play of the 24 base tracks in R.C. Pro Am can be seen on YouTube here. It’s utterly ridiculous. – When it comes to the sequel, it was covered by the Angry Video Game Nerd in James and Mike Mondays a little while ago. It doesn’t look like anyone has cared enough to upload a proper speedrun to YouTube, but there is a longplay here. – NES Guide, a good resource for that system, has a list of racing games for the system. This forum post at Atari Age is also useful, since it lumps them into single and multiplayer games. As mentioned on the pod, Excitebike was the first to come out, in October 1985, followed by Mach Rider in August 1986, which was more of a mixture of shooting and arcade racer. Square’s Rad Racer came out in October 1987, which was then followed by R.C. Pro Am in February 1988. – There is a Genesis version of R.C. Pro Am, and it’s essentially an enhancement of the original. Records are saved and what not, which helps too, I’m sure. However, it came out in 1992, when the racing scene was crowded with other, better games. – On Amazon, the first game is around $10, but the second goes for a premium – between $65 and $100. eBay is a bit more reasonable on the first, with $3 to $10 for just the cart, and $18 to $25 if you want the box and manual. The second game still goes for $35 to $100, for just the cart, and the only box and manual and cart combo is $213.74. The Genesis version is $5 to $10, even with the box and manual.